A lot of our work consists of domestic window cleaning. With every window clean we also include frames, sills and doors as standard. 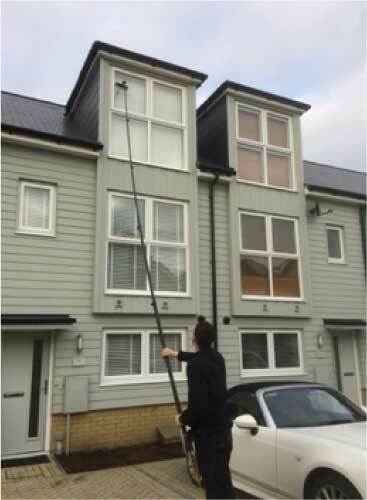 We clean windows using top of the range telescopic poles allowing us to be able to reach the difficult areas that you wouldn't be able to reach with ladders with capabilities of 40ft+ eliminating the need for machinery, scaffolding and ladders. We also use purified water which means that it has been filtered and is free from minerals that are found in tap water. This means that when the water dries, it doesn't leave anything behind, leaving the windows clean for a long time. The water doesn't contain any soap or other chemicals and is an environmentally friendly method.